DALLAS, TX -- Military service changed the Dallas gunman from an extrovert into a hermit, his parents said in an interview excerpt published Monday. Micah Johnson's mother, Delphine Johnson, told TheBlaze website in an interview that her son wanted to be a police officer as a child. His six years in the Army Reserve, including a tour in Afghanistan, were "not what Micah thought it would be ... what he thought the military represented, it just didn't live up to his expectations." According to the military lawyer who represented him, Johnson was accused of sexually harassing a female soldier while deployed. 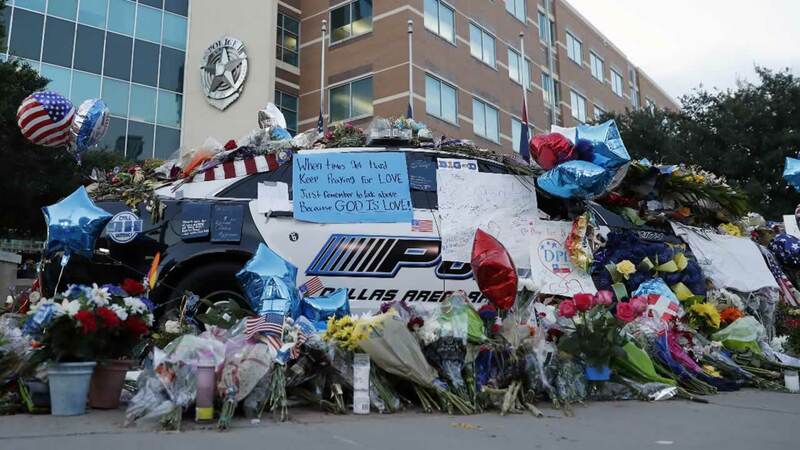 The black 25-year-old fatally shot five officers in Thursday's attack while hundreds of people were gathered in downtown Dallas to protest recent fatal police shootings, and wounded at least nine officers and two civilians. The police chief again defended the decision to use the robot, saying he had "already killed us in a grave way, and officers were in surgery that didn't make it." "This wasn't an ethical dilemma for me," Brown said. "I'd do it again ... to save our officers' lives." Authorities have said Johnson had plans for a larger assault, possessed enough explosive material to inflict far greater harm and kept a journal of combat tactics. Eleven officers fired at Johnson and two used an explosive device, Brown said, adding that the investigation will involve more than 170 hours of body camera footage and "countless hours" of dashcam video. Surgeons at Parkland Memorial Hospital spoke Monday afternoon about treating some of the victims. Dr. Brian H. Williams, who is black, said: "It weighs on my mind constantly (that he was unable to save the officers ... It has to stop. Black men dying and being forgotten. People retaliating against the people sworn to protect us." Dr. Alex Eastman, the director of the hospital's trauma center who also is a deputy medical director with the city's police department, said the shootings "rocked some guys to their core that I thought were unshakable." Brown provided details of authorities' negotiations with police Sunday on CNN's "State of the Union," saying Johnson laughed at authorities, sang and at one point asked how many officers he had shot. Johnson insisted on speaking with a black negotiator and wrote "RB" and other markings in blood on the wall - the meanings of which were unclear and being looked at by investigators, Brown said.